​The Poonsang is a rare breed that excels in hunting large prey in small packs such as tiger, deer and wild boar. It is said that only three dogs can take down a Siberian Tiger. As a secondary role it also works as a property guard. 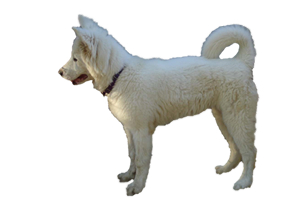 Similar in appearance to the Jindo, the Poongsan originates in the district of the same name in South Hamkyong Province, North Korea. Some believe the breed is a descendant of the Lakia dogs of Russia and others state the Poongsan dates back as far as the New-Stone Era. Like all other Korean dogs they faced extinction when it was heavily slaughtered for its fur by the Japanese during WWII. After the war they were recognized as a national treasure, a title they share with the Jindo and Sapsaree. Today almost all Poongsans remain inside of North Korea and many of those that are not have questionable bloodlines. Is the Poonsang Right for You?